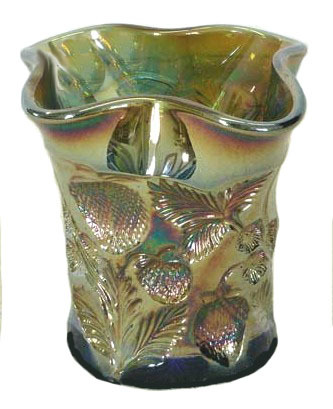 Cambridge produced its first Carnival Glass in 1908, second only to Fenton. 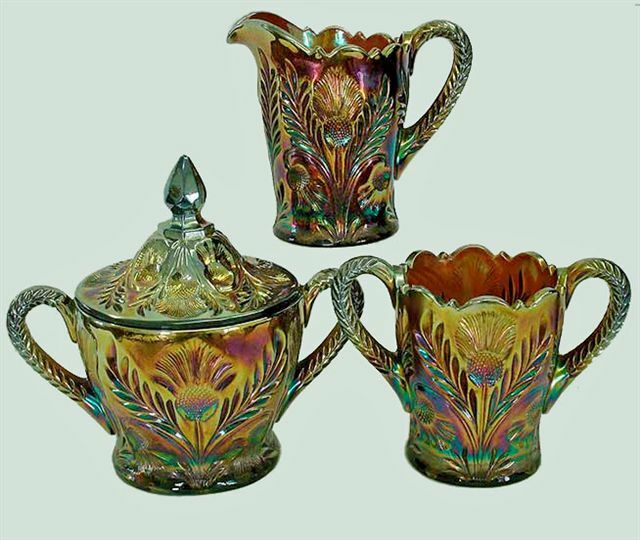 According to Colors in Cambridge Glass, Cambridge also produced Carnival Glass during the years 1916 -1917. Their four color classifications: Marigold on Crystal blanks; Green on Emerald blanks; Blue on Royal Blue blanks; and Purple on Mulberry blanks. All of the blank colors are the early colors introduced into the Cambridge line in 1916. All of the blanks used for Cambridge Carnival came from various Nearcut lines and many pieces are signed “Near Cut.” Cambridge Carnival Glass is relatively scarce today, indicating not a great deal was produced. CAMBRIDGE HOBSTAR: This pattern is shown in Cambridge Book #2, by Mary, Lyle and Lynn Welker. The book is comprised of pattern reprints from old Cambridge Catalogs. Cambridge Hobstar is listed as #2351. An account of the pattern was written by the late John Britt in 1990. At that time, only a green and a marigold punch cup had surfaced. Later, the punch bowl/base were found in green. The #2351 pattern is shown in many shapes in the Welker’s book, indicating the possibility that only the punch set was produced in carnival glass? 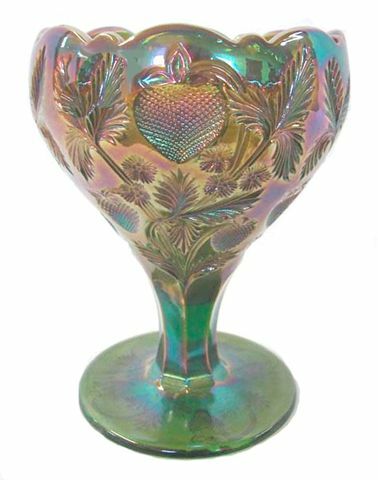 Welker’s Cambridge Book #1 contains Cambridge Glass patterns, such as Inverted Strawberry, Near-Cut Souvenir, Sweetheart, Inverted Feather and Inverted Thistle. INVERTED FEATHER Tankard - Fall 1908 Butler Bros. Catalog. Left: - INVERTED FEATHER Tankard - Amethyst. Right: - INVERTED FEATHER Tankard - $4250. - Seeck Auction - 7-10. 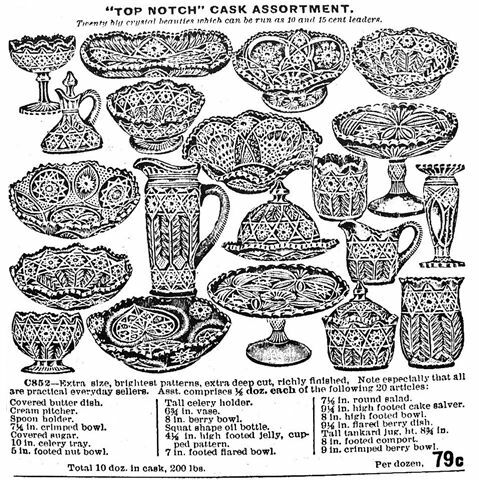 1910 catalog ad showing Inv. Feather vase. 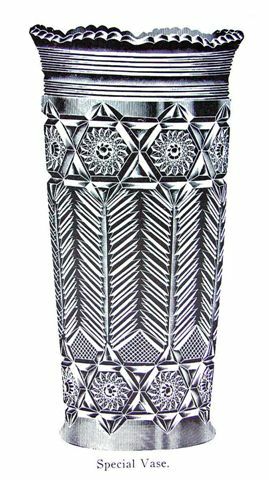 INVERTED FEATHER Tankard: As revealed in the Butler Catalog Ad, the pattern dates to the earliest exposure of carnival glass. 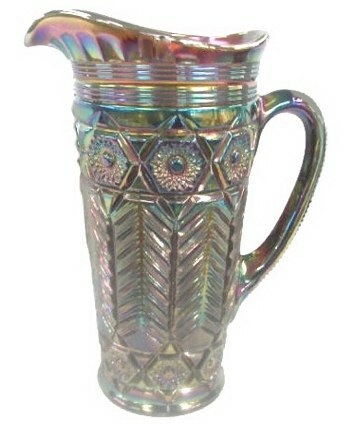 Any of the iridized Cambridge items are rarities, but the tankard in this pattern rates quite high in the realm. There may be only a couple in amethyst. One brought $17,000 at auction. 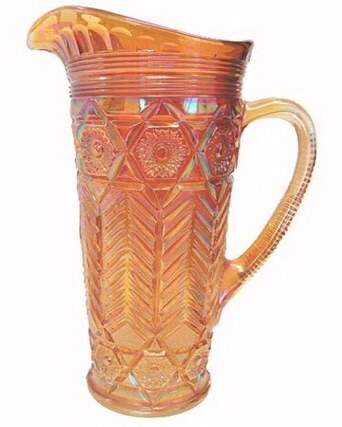 The only known marigold tankard with chip at the handle was sold in a July 2010 Seeck Auction. The 1910 Cambridge Factory Catalog displays a “Special Vase” which is likely the basic mould for these rare tankards. A ruffled-top vase in marigold is known to exist. Courtesy Seeck Auctions - $1000 - 7-10. INVERTED FEATHER 4-Pc. Table Set: Table sets are extremely scarce in this pattern. Individual pieces are sometimes found, but a complete set is very difficult to locate. Amethyst is the usual color. Amethyst INVERTED THISTLE - Courtesy Seeck Auctions. INVERTED THISTLE 3-Pc. 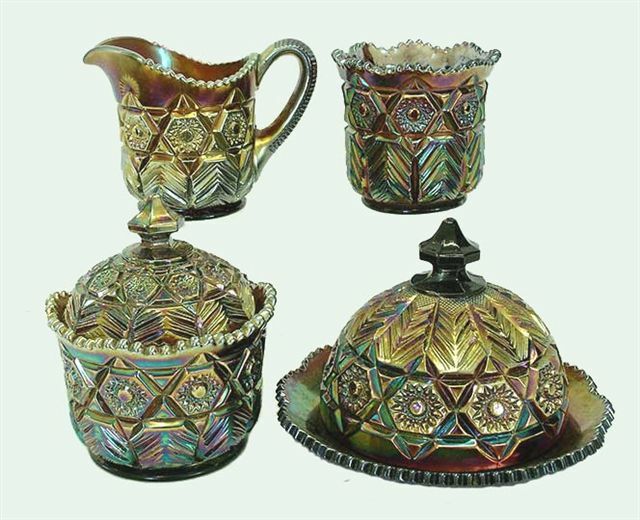 Table Set: Four piece sets are known in amethyst, green and marigold, but this pattern is not seen as often as Inverted Strawberry sets. Butter dishes seem to be least often available, making completion of a set quite difficult! in Rose Bowl Shape. $6000. 5-08 Wroda Auction. 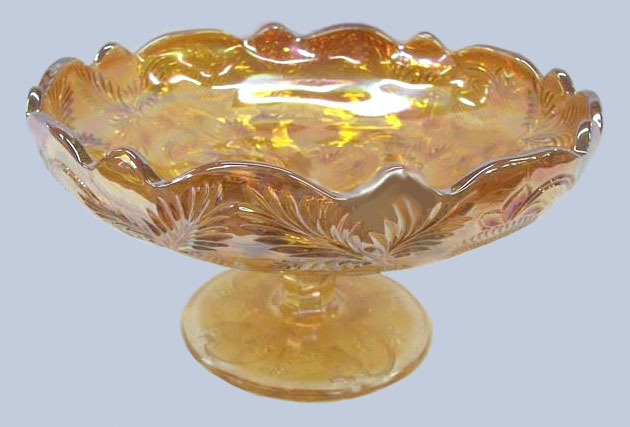 INVERTED STRAWBERRY Tall Compote: Written evidence of long standing describes this 6” compote in marigold and amethyst, having a sloping side. 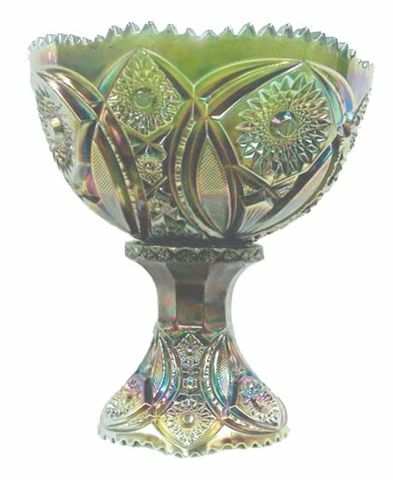 This example in green with the cupped-in top (rose bowl shape) could well be a one-of-a-kind. INVERTED STRAWBERRY 10.75 in. diam. Ruffled Bowl. 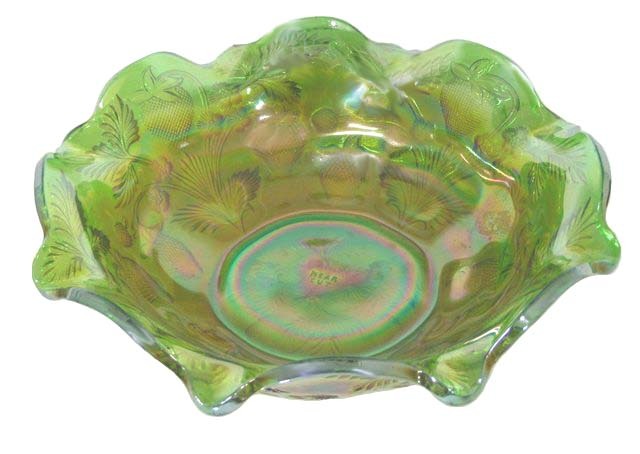 INVERTED STRAWBERRY Bowl: This 10 ¾” ruffled shape in green is not one we have listed in any of our other segments on the subject. 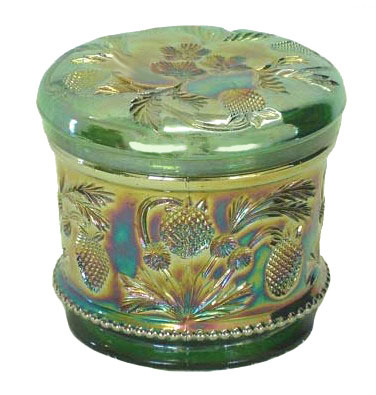 Whether marigold and amethyst bowls are to be found in this style, we do not know. Scarce color sold for $275. in July 2010.
in Marigold sold for $650 in July 2010. INVERTED STRAWBERRY Large Compote: This larger size compote in marigold is said to be the most “common” color. Actually, nothing in the Cambridge line of carnival glass comes anywhere near being in that category! All compotes are hard to find. A couple of 4” small blue ones are known. One sold for $2700. in 1993! Green NEARCUT INV. STRAWBERRY Whimsey Tumbler. INVERTED STRAWBERRY Tumbler Whimsey: If blue is “spooky” new, then perhaps the buyer would know that? This green whimsey turned up in the 2009 Seeck Auction for the San Diego/Southern Calif. Club’s Convention. pulling them out of the fire, hating even the garment defiled by the flesh.